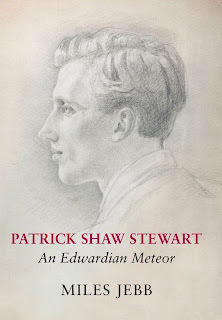 Patrick Shaw Stewart was the author of one of the finest lyrics of the First World War, and of no other poetry of note. The case for a full dress biography does not, therefore, seem compelling. Yet at 243 pages, Miles Jebb's account justifies its detail. This is the study of a remarkable man --- remarkable on his own merits, and remarkable for moving in social circles which included so many of the great men and women of the day. Shaw Stewart listed among friends and acquaintances the Asquiths, Winston Churchill, Rupert Brooke, Denis Browne, the Grenfell brothers, Ronald Knox, and Duff Cooper, and his love affair with the great beauty of the age, Lady Diana Manners, would almost certainly have been doomed even had he survived the War. Miles Jebb has done a great service by bringing Shaw Stewart and his group to life. My only regret is that he spends so little time on Shaw Stewart's masterpiece, 'I saw a man this morning', and his few references to it seem ambivalent: he describes it as 'rigidly in the style' of Housman's A Shropshire Lad. Rigidly? For a thorough and more appreciative treatment of that poem, and (inter alia) evidence of Shaw Stewart's compendious knowledge of salacious passages in classical texts, the study to consult is Elizabeth Vandiver's superb Stand in the Trench, Achilles. Update: there is a very useful new website dedicated to the biography and to Shaw Stewart here.
" 'by the strenuous efforts of me and one or two others, the election of a Polish Jew from Balliol, much the strongest candidate really, was prevented.'" Yes, Namier, 'who was to become the foremost historian of British politics in the eighteenth century'. Professor of English at Exeter. Editor, Poetry of the First World War (OUP). Presenter, Ivor Gurney: The Poet Who Loved the War (BBC TV, 2014). President of The War Poets Association.